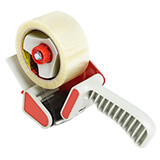 This standard acrylic tape is available in either buff or clear film and is used extensively in busy packing departments for sealing, packing, bundling and general packaging on a wide range of surfaces such as cardboard, metal, glass, wood and many plastics. Its superior temperature resistance and clarity makes this 28 micron acrylic tape a popular choice when appearance and cost are key considerations. Can be used with a standard pistol grip tape dispenser and will not break under normal packing tension. Perfect for the majority of lightweight packaging applications. 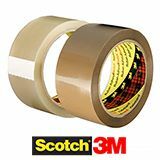 For a branded alternative with special low prices, why not try 3M Scotch packing tapes. Read how choosing the correct adhesive tape is the key to problem free carton sealing. Low prices and generous quantity discounts of up to 40%!